Golden Cocker Retriever - The Perfect Mixture Of Personalities? You are here: Home / Breeds / Mixed / Golden Cocker Retriever – The Perfect Mixture Of Personalities? Welcome to our complete guide to the Golden Cocker Retriever. The Golden Cocker Retriever is a result of cross-breeding between a Cocker Spaniel and a Golden Retriever. Two of America’s favorite breeds mixed together result in a pretty adorable mix! This is not to be confused with the Dakota Sport Retriever. While similar, the Dakota Sport Retriever is a second generation mix. It’s a blend of a Golden Retriever with a dog that is a mix of the American and English Cocker Spaniels. There is currently a lot of controversy around first generation mixes, so we will discuss those concerns first. Then, we will get into the specifics of the Golden Cocker Retriever mix. Have you heard first generation mixes called “designer dogs”? This is because they are usually the result of someone intentionally mixing two purebred pups to design a new mixed breed. There is a lot of controversy on the topic. Two great articles that represent both camps fairly can be read here: Purebred vs. Mutt and Purebred vs. Mutt. Both articles cover the pros and cons of both sides, so that you can decide for yourself what to believe. A common argument in support of mixed breed dogs is that they are healthier. This is too broad a statement to always be true. However, it has been shown that, in general, purebreds have reduced vigor compared to mixed breed dogs. This means they tend to have shorter life spans and a lessened ability to produce offspring. But it doesn’t necessarily mean they have more health problems. Keep in mind that research has shown that inbreeding (which is how you get purebreds) results in a smaller genetic pool, which means less chance for variety. Some supporters of purebreds claim this as one of the benefits, since it makes it easier to predict what a puppy will be like. However, the downside of it is that you increase the likelihood of passing on genetic traits that cause health problems. Just keep in mind that, ultimately, the health and welfare of your puppy should always be your primary concern, whether it’s a pure breed, a designer dog, or a mutt. The Golden Retriever Cocker Spaniel mix can actually be one of two different crosses. This designer dog could be the result of a Golden Retriever crossed with an American Cocker Spaniel or the result of a Golden Retriever crossed with an English Cocker Spaniel. While the American and the English Cocker Spaniel are very similar, they are actually considered to be distinct enough to be registered as separate breeds with the American Kennel Club (AKC). All three potential parent breeds of this mix are registered with the AKC, and they are all classified as part of the “Sporting Group” of dogs. As sporting dogs, they are all known for their instincts in woods and water. Both Cocker Spaniel breeds and the Retriever tend to be friendly, active dogs that are relatively easy to train. These breeds have calm, stable temperaments. They also have lovable personalities. A puppy could end up with the traits of either parent breed, or a mix of the two. If you’re trying to predict which traits might be possible in a puppy, make sure to ask which type of Cocker the parent was. We will go into more detail about all three breeds to give you a better idea of what some of the possible outcomes are. As mentioned, a Golden Retriever and Cocker Spaniel mix could end up looking like either parent. We’ll briefly describe all three possible parents to show the range of possible appearances that could show up in one of these adorable puppies. Male Goldens will range between 23 and 24 inches tall and 65 and 75 pounds in weight. Females tend to be between 21.5 and 22.5 inches tall and between 55 and 65 pounds in weight. As you can guess by the name, these dogs are always golden in color. They could range from light to dark golden, but you’ll never find a purebred sporting any other coat color. These golden beauties tend to have broad heads with short ears and straight muzzles. Golden Retrievers have a shorter coat on their head, paws and front of legs, with heavy feathering on the front of the neck, back of thighs and tail. An American Cocker Spaniel is the smallest sporting Spaniel. Males typically range between 14.5 and 15.5 inches tall and 25 and 30 pounds in weight. Females tend to be between 13.5 and 14.5 inches tall and between 20 and 25 pounds in weight. Cocker Spaniels can be one of 13 different colors and have one of two different types of markings. They are sturdy, compact dogs who are considered well-balanced of form. They have a fine coat of medium length. English Cocker Spaniels are typically larger than their American cousins. Males generally range between 16 and 17 inches tall and 28 and 34 pounds in weight. Females tend to be between 15 and 16 inches tall and between 26 and 32 pounds in weight. Otherwise, their appearance and coat is very similar to their American counterpart. Although Cocker Spaniels come in a range of colors, typically a golden shade is selected to breed with a Golden Retriever in order to create the Golden Retriever cross Cocker Spaniel. That way, the “Golden” name can be maintained. Some people have coined the term “forever puppy” in reference to this cross breed. This is because some of the puppies look like miniature Golden Retrievers. The hype is that they look like puppies that just never grow up. While this may be true of some Golden Cocker Retrievers, there is no guarantee that every puppy will turn out looking like a Mini Golden Cocker Retriever. A mixed breed could end up looking like either parent, or anything in between. This is an important point to be aware of, as the range from 20 pounds to 75 pounds is quite large! All three potential parent breeds have two coats, with a medium length top-coat. The Golden’s coat tends to be dense, while the Cocker Spaniels have much finer, silkier hair. Considering that all three breeds have plenty of hair, regular grooming is required to avoid tangles and mats. All of the possible parent dogs are known for shedding, particularly at the changing of the seasons. Therefore, it’s reasonable to expect shedding and frequent grooming in any resulting mixed breed puppy as well. 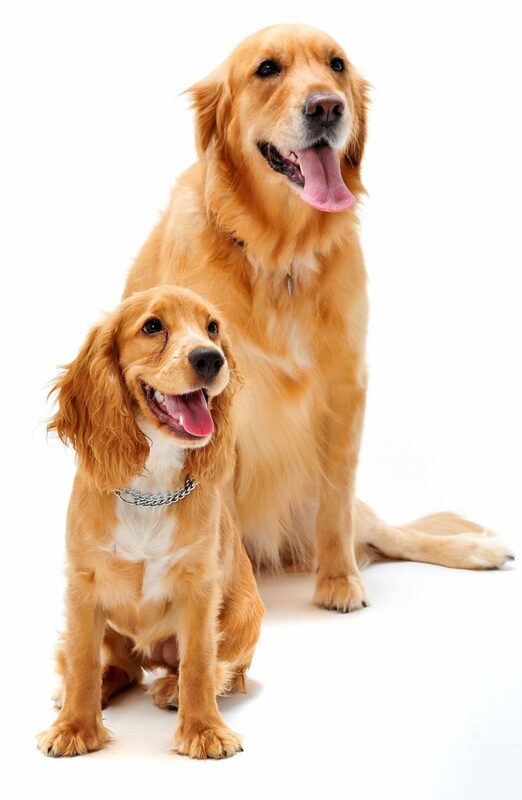 Both Golden Retrievers and Cocker Spaniels are known for their stable, even temperaments and their friendly, loving natures. Both breeds are also considered outgoing dogs that love to play and are relatively easy to train. Since both of the parent breeds have very similar temperaments, it increases the likelihood that a Golden Retriever x Cocker Spaniel dog will also exhibit the same behavioral traits. These dogs are known for loving people and being eager to socialize with humans. They generally make intelligent pets that have a strong desire to please. However, it is important to check the temperament of both parents, and the background and upbringing of the dog. You should also ensure that your pet has proper socialization and training. Two common health conditions in both Golden Retrievers and Cocker Spaniels are hip dysplasia and elbow dysplasia. Dysplasia is when the hip or elbow joint and ball socket are not properly formed, causing them to rub and grind together. The condition causes pain and a wearing of the bone that can lead to loss of mobility. It’s important to know that symptoms of this disease tend to not show up in puppies until between 4 and 6 months of age. Studies have shown that treatment done before your dog reaches 2 years old tends to be more successful. When buying a Golden Cocker Retriever, make sure that both parents have good hip and elbow scores. This will reduce the risk of your puppy inheriting this condition. Both Golden Retrievers and Cocker Spaniels also share a history of various eye problems. Specifically, both breeds have a genetic predisposition for cataracts. They are also both known to inherit progressive retinal atrophy (PRA). Golden retrievers are known to be prone to cancer. According to a research study, close to 40% of Golden Retrievers will die from the disease. Cocker Spaniels have additional health concerns including an increased risk of immune mediated hemolytic anemia (IMHA), epilepsy, seborrhea, otitis externa, and cardiomyopathy. Both the Cocker Spaniel and the Golden Retriever are high energy dogs built for endurance. This means that your Golden Cocker Retriever is likely to also have these traits and will require regular physical activity. Since both Golden Retrievers and Cocker Spaniels are in the Sport Group of dogs, they tend to excel at running, hunting, fetching, and swimming. Due to this, extended outdoor exercise will be preferred by your Golden Cocker Retriever. Based on all three possible parent breeds, a Golden Retriever and Cocker Spaniel mix will likely be eager to please, which should make training relatively easy. However, training is still important to ensure your pet is well-adjusted and properly behaved. 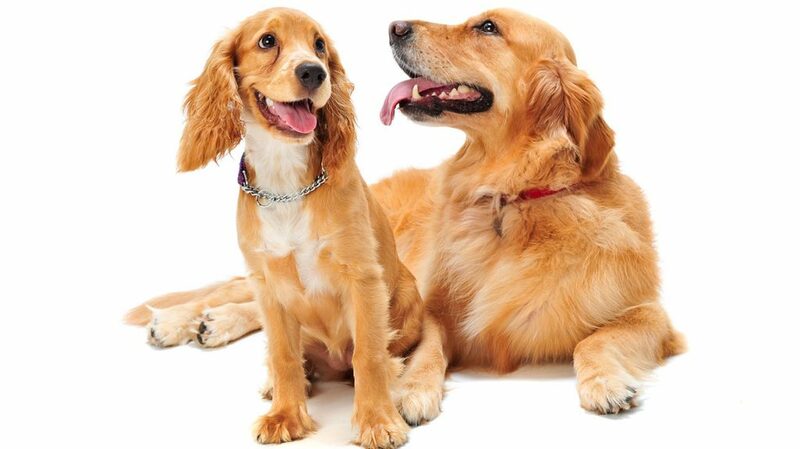 Both Golden Retrievers and Cocker Spaniels tend to be loving, social animals that will do well in a home with small children and other pets. However, remember that training and socialization are important to ensure your dog is a proper house mate. As sporting dogs, Golden Retriever x Cocker Spaniel pups will enjoy lots of outdoor exercise. This means that a home with a large open area, or a family that will take their pup out to suitable natural environments, is ideal. Both Golden Retrievers and Cocker Spaniels are known for loving human interaction. They will be happiest in a home where humans are around often, as they prefer not to be left alone. A Golden Cocker Retriever will likely be a medium-sized dog that sheds and requires frequent grooming. If you are looking for a low-shedding or hypoallergenic pet, this is not the dog for you. Golden Cocker Retriever puppies are becoming more popular. However, since they are still fairly new, it can be challenging to find a reputable breeder near you. You may be able to find a Golden Cocker Retriever puppy online, either through designer dog breeders or other animal sale and adoption websites. It’s important to ensure your puppy is coming from a reputable source. Pay attention to the type of living conditions the puppy is in. Ask about both parents and get as much information as you can to understand the background of your puppy. Please note that you could end up with any aspect of either dog breed, and your dog could end up having a medical condition not seen in either parent. This is why socialization, training, and health testing are all so important. The Golden Cocker Retriever price can vary widely, depending on the breeder. Expect to pay at least $500-$1000 for a well-cared-for puppy. A possible alternative is to check out a local, reputable adoption agency to see if they have any Golden Cocker Retrievers that have been rescued and are in need of a good home. Do you have experience with this mix breed? Let us know about it below! Dobson, J. Breed-Predispositions to Cancer in Pedigree Dogs. ISRN Veterinary Science, 2012. Glickman, L., Glickman, N., Thorpe, R. The Golden Retriever Club of America National Health Survey. Purdue University School of Veterinary Medicine, 2015. MacMillan, AD., Lipton, DE. Heritability of multifocal retinal dysplasia in American Cocker Spaniels. Journal of the American Veterinary Medical Association, 1978.